Written by Ivana McConnell on January 31, 2018 . We first launched our Twilio action back in 2016, and since then, we have made several improvements and additions— short code support among them. But we also got questions about Alphanumeric Sender ID – sending SMS messages with your company or brand name as the sender, rather than a phone number. This kind of send, though one-way, allows for maximum brand visibility and a strong first impression. And now, we support it in Customer.io! Read on to learn more about what’s changed, and how you can start sending Twilio SMS using your own Alphanumeric Sender IDs. You can still send your Twilio SMS from a phone number as before. 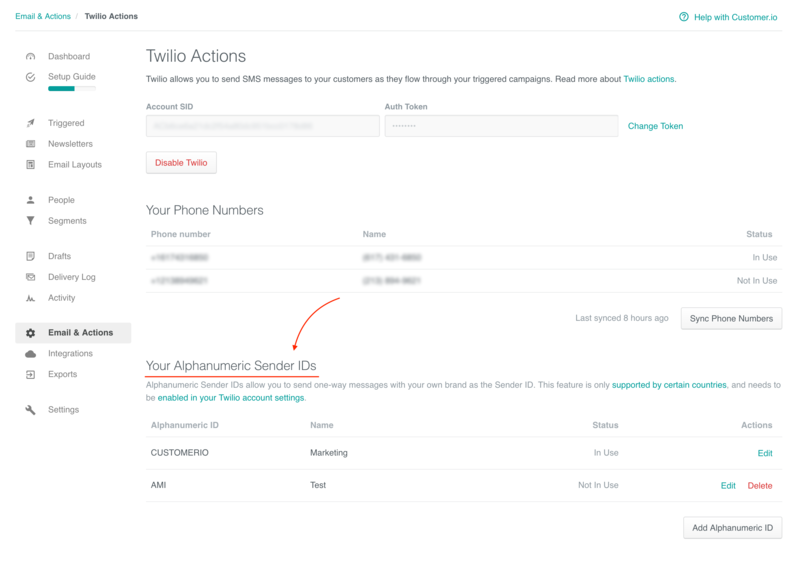 But now, in your Twilio settings area, you’ll notice a new section for Alphanumeric Sender IDs: If you’ve upgraded your Twilio project and enabled the Alphanumeric Sender ID feature in your Twilio project settings, you can add and send from these identities in Customer.io! The first time you add a new one, we’ll pop up a modal to ask you to make sure the feature is enabled in Twilio. Then, you can tell us which ID you’d like to send from and give it an (optional) friendly name or description: Then, when you go to compose your Twilio SMS, your new Alphanumeric Sender ID should be available in the ‘From’ dropdown: And you’re done! There are a few differences in sending your SMS from an Alphanumeric Sender ID as opposed to a phone number. Enable the feature in Twilio first! You can add these in Customer.io, but if you haven’t enabled it in your Twilio project settings, the message will fail. They’re one-way: Your customers cannot reply to them. Opt-in/opt-out: Customers receiving these should have opted in to your service and be informed on how to opt out. They’re not supported in all countries, including the USA: If you try to send to an unsupported country from an Alphanumeric Sender ID, your SMS will fail to send. Note that some require sender ID pre-registration with Twilio. This was an oft-requested feature, and we’re really excited to roll it out for you! If you’d like to learn more, we’ve documented it on our Knowledge Base. And as always, if you’ve got questions, feedback, or need a hand, we’re here for you at win@customer.io!